Want to transfer your existing Straight Talk phone number and remaining service balance to a new phone? Well, you can, and in some cases using that new phone is as easy as moving the SIM card from your current phone to a your new phone. Your current phone and your new phone use the same size SIM card. If all three of these conditions are true, simply remove your SIM from your current phone and put it in your new phone. Once the SIM is in your new phone, make sure the phone has recognized the SIM. If it has, check that you can make phone calls and send text messages. Also check that your able to use cellular data to access the internet as well as send and receive MMS picture messages. If your unable to make phone calls or send and receive text messages you may need to transfer your service to a new SIM card or contact Straight Talk support for help. If calls and texts work, but your data and MMS picture messages don’t you may need to set the Straight Talk APN settings on your phone. See smartphonematters.com for help with that. Sometimes you can’t move your SIM and you’ll need to transfer your service to a new one. If your current phone is using Straight Talk’s Verizon or Sprint network, you should also transfer your service. You may find that if you move your Straight Talk Verizon or Sprint SIM to your new phone it works, but I don’t recommend you do that. Straight Talk, Verizon, and Sprint all want to make sure that the specific phone you are using is registered on their network. You may encounter problems later on. And, if you simply move your SIM to the new phone, your old phone will still be registered to your Straight Talk account and cause problems when someone else tries to use it with Straight Talk or another wireless company. If you bought your phone from Straight Talk and don’t activate it with the SIM they included in the box, you might find that they won’t unlock the phone for you later. When you buy new Android or iPhone directly from Straight Talk, the phone is locked and can only be activated with Straight Talk. After 12 months of use on their network, Straight Talk will unlock your phone. However if you didn’t register it or activate it using the SIM, later you might find they have no record of you using the phone on their network. I don’t know that this is the case, but something to consider. Hi. I have been sent a new phone. A Robin from Nextbit, and its nice, and my sim card fits into the new phone, but I have no service. I thought about using straighttalk website but it said the phone was not compatible and to buy one of their phones. This doesn’t make sense to me because two friends of mine have the exact same phone and use straighttalk, I’m so confused as to how to solve this problem. The Robit Nexbit is a GSM only phone. It should work with Straight Talk’s ATT or TMobile towers but not their Verizon towers. Do you know which towers your previous phone used? And that compatibility check you did on the Straight Talk website is only for their Verizon towers. If you want to use that phone you may need to move your service to a new Straight Talk att or tmobile SIM. I’m glad I read this because I’m going through it with straight talk right now. I started my straight talk experience with my Motorola Nexus 6 unlocked from Amazon. Just a few days ago I bought a Google pixel XL first generation. Both phones will work on either CDMA or GSM just not at the same time. I simply transferred my nano SIM to the pixel XL and I can get texts, and calls but no data and I haven’t even tried sending a picture to anyone yet. It’s been almost two days since ordering a new SIM card and it hasn’t shipped yet. Did you set the APN? Are you using the AT&T or Verizon ST SIM? I’m using the straight talk Verizon nano SIM card and from what I’ve been told the nano SIM allows my pixel XL to check for services. That’s why I have some but not all like mobile data. Straight talk can’t change the IMEI number on my current nano SIM card from my Nexus 6 to my pixel XL. I’m waiting for my new SIM card to be delivered, then call customer service to transfer my account information and register my pixel XL on the new SIM card. Yea. with the Verizon towers you need a new SIM. You should only move the SIM if its for the ATT or TMobile towers. Thanks….I just done the same thing too. You may need to set the APN. I don’t have an up to date article. This article will be you an idea how to do it Setting Your Straight Talk Wireless’ APN on your Google Nexus 5 with Android 5 (Lollipop). You’ll need to use the APN settings for Straight Talks Verizon network from here: Straight Talk APN Settings. Let me know if you can’t figure it out. For ST using Verizon or Sprint towers. For ATT or T-Mobile moving the SIM is fine. Want to buy A note8 I have a note5..Straight talk..how do I transfer everything over?…Ive been told everythings not on your Simm card…some things are In the phones memory…any help would be good!…oh both of these phones are Unlocked. You can break it down into three parts. Transferring your phone service. See Transferring Your Existing Straight Talk Service to a New Straight Talk Phone or SIM. Then you need to migrate the data on your phone. Some of this can be done by syncing with your Google account. Google may not move things like your text messages. since both phones are Samsung, you might want to check out this. So I bought an iphone 5 with the ST sim and put it in my Galaxy Note 5 on Verizon and it works fine. You said this would cause problems later on what did you mean by that it wasn’t very clear. I would like to use my note 5 over the iPhone but want to keep my number and what not from the iPhone. While moving the SIM does work, your iPhone 5 is the phone still registered on Straight Talk’s Verizon network. If you ever try to reuse the iPhone 5 on Straight Talk you’ll have issues. You can get a new SIM and transfer your service to the Note 5. That would be the proper way to do it. While not so much recently, for a long time I’d hear about more problems with ST’s verizon network than their ATT and T-Mobile network, so its a preventative step. And I have heard of people doing what you did only to find their service is disconnected when they forgot about their old phone and someone else activated it. I have a LG Stylo 3 and I it has a message on my screen that won’t go away, so I was told to get a new phone and I did just that. I have a Verizon Wireless iPhone 6 that doesn’t have a sim card, but I want to transfer my service to that phone. Will you or someone please help me because I’m stressing very badly. Thank you so much in advance. I have a Huawei AT&T phone and I would like to use my Straight Talk SIM card in my new phone. Is this possible and if so, how? Hello. I had to buy a new phone from Wal-Mart. Which is a straight talk phone. My old straight talk phone had gotten broken. I tried to retrieve all my contact s ect. But I cant. I don’t remember my password for my gmail.Can I take out my old SIM s card and put it into my new straight talk phone and get all my contact s and stuff back ? Thank you so much. I need help . The information on your old phone isn’t stored on the SIM cars, so no. While it is possible to store phone numbers on the SIM card, most phones aren’t set up that way anymore. Your best option is to try and recover your google password and see if your information was backed up into the cloud. If you have the same number and shared your number with Google, it think you may be able to get google to text you a password recovery option. If you have another email address you have used that as a recovery option. You could put the old sim in your phone to see if you could recover phone numbers from it but I doubt they are there. What type of phone was your old phone? I just bought a new Iphone 6. I already had an iphone 6, both purchased on straight talk. The new phone is making me use the new sim card, but I’ve lost visual voicemail now. Any ideas on how to get it back? If I switch back to the old sim card, it says no service. HOWEVER, when I initially transferred to the new phone, I had the old sim in, and everything worked for a few minutes, then no service popped up. I changed sims and it works, everything except visual voicemail. Going to return the phone if I can’t get it to work properly! Straight Talk does not officially offer Visual Voicemail as a feature, only regular voicemail. However most, but not all, customers have found that if you are using Straight Talk’s Verizon towers Visual Voicemail worked. But a few customers have told me when they called support to about problems or when it stopped working, support was aware of what they were talking about. In your case, the most likely explanation is that is the your old iPhone 6 was using the Verizon towers and the new one is using the AT&T towers and in that case you will only get regular voicemail. Let me know if you are using the AT&T or Verizon towers. You can contact Straight Talk support via online chat, tell them your phone number and ask which towers your phone uses. Your phone will work with Straight Talk’s AT&T sim card, but you’ll need to check the serial number of your phone to see if you can use it with ST’s Verizon network. See Checking If You Can Use Your Verizon Smartphone with Straight Talk Wireless. If you are interested in using the Verizon network, see . Note both Straight Talk and total wireless no longer have the 5MB max download speed. I have a iPhone 5se I bought it and it came with the SIM card and I’m wanting to trade my iPhone for a s6 Verizon phone will my SIM card work in that phone or do I need to get a new SIM card kit? I covered this in the article was something not clear? I have a Droid Turbo 2 that I have through Verizon. I had been mentioning going back to straight talk to save some money. Well a family member bought me a straight talk phone and a service card. My question is assuming the SIM cards are the same size, can I just use the SIM card that came with this new phone, and place it in my Turbo 2? My wife currently has a straight talk iPhone se and is wanting to get the straight talk iPhone 6 … I am going to be getting her SE … Will the SE sim work in the 6 and can I use the 6 sim in her old SE ? The SIMs will fit as the are both nano SIMs. They should work too. If your both using the ST ATT network you can just swap. If you either of you are using the STR Verizon network you really should get new SIMs and transfer the service. The new iPhone 6 should come with a sim card. If I successfully move my sim card to another phone will my contacts and and messages be saved? not on a smartphone…you’ll need to backup and restore data to the new phone. I have a straight talk iPhones 5 16gb. I have a friend that gave me his iPhone 6 64gb that was on sprint. I have checked online and it says this phone will not be compatible with straight talk, but I tried swapping my SIM card anyway. It works in the new phone. In your article it says this can cause problems later on. If I buy a activation kit and put the sprint sim in will it work? If I deactivated my iPhone 5 to give to my step dad is this going to cause problems with my new phone? I really want to use this iPhone 6. In your opinion what is my best option? 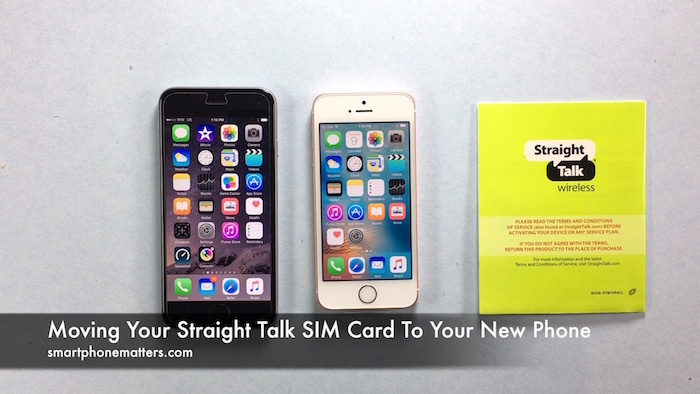 If you are using Straight Talk’s AT&T network and want to transfer your service to a new SIM, see Transferring Your Existing Straight Talk Service to a New Straight Talk Phone or SIM. If you are an AT&T customer, just go to an AT&T store and they will replace it. My phone broke and I’m getting a new one. Both are straight talk compatible, they use the same size sim, and the old runs on verizon towers while the new is unlocked. They are both Galaxy s5. However, a customer service rep told me that the sim cards can never be switched between phones as when you activate them you bind the card to the phone, and it cannot be used with any other so I must buy a new one. Is this the case, and if not, will I have to go through straight talk at all to have the service switched? I don’t have the password to the account. If the two phone were BYOP when put the ST Verizon SIM in your new phone it should work. If they are straight talk purchased phones it might work. You really should register the new phone and transfer the service to a new SIM as they do want the phone’s MEID registered on the Verizon network. In your case no one will ever use the broken phone so it shouldn’t be an issue. I have the straight tallk branded LG sunset too. It runs off at&t towers. I took the sim out the LG and put it in Honor 5x. It worked. I left it in all day. But the the next day around 2pm it said no service.took sim out and put it back in LG. Following day I tried in the 5x again and it worked. Why did it do this? I don’t know. If you continue to have problems transfer your service to a new SIM. Could be straight talk, doesn’t want you using the SIM in the phone. Could be a problem with the 5x. Is the 5x new? have you used it with any other service? I just bought a Galaxy Note 4 that is unlocked and I currently have a LG SUNSET or LG [l33l] which is a prepaid phone through Staighttalk wireless. The SIMPLE card is Active so I just moved it to the Galaxy Note 4 and everything works but Internet, I am able to make phone calls but no service. And the Galaxy reconizes that it is not a Verizon SIM.